We think two of the most difficult dolls to identify are Mama dolls and the Patsy types, and that seems to be the reason they are a "type", lol. They were both extremely popular doll types, thus all the doll companies wanted to make a doll that was popular with the public. 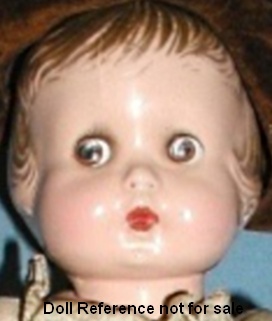 Effanbee produced the Patsy family of dolls beginning in 1926 thru to 1946. 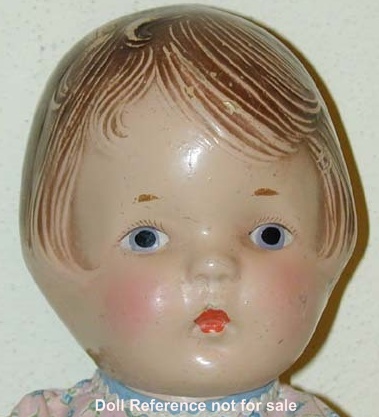 Prior to this Hertel & Schwab & Co. made mold 127 a bisque head 17" tall doll, composition body, with hair and bangs in a similar style as the F & B Patsy's, thus this doll mold, is so called "Patsy" by collectors and certainly pre-dates the Effanbee dolls. ca. 1900s Hertel Schwab & Co, so called Patsy doll mold 127, named by collectors as the hair style is so similar to the later composition Patsy dolls made by Effanbee, 17" tall, bisque head, glassene eyes, painted upper and lower lashes, open mouth with two upper teeth, composition jointed body, right arm bent. 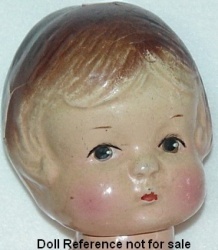 Similar molded hair style as the later "Patsy" dolls, short hair that curls slightly towards the face over the ears, slight part in the middle of the short bangs. 1928-1929 Butler Brothers Tootse doll, 14" tall, composition socket head, composition jointed body with or without body twist waist, molded painted hair, painted eyes looking straight ahead, closed mouth, doll marked Tootse. 1929 Averill Jimmie (boy) or Dimmie (girl), 14" tall, socket head with all composition jointed body with/or without body twist ball joint waist, molded painted hair, large painted eyes, dolls are unmarked but had a wrist tag. 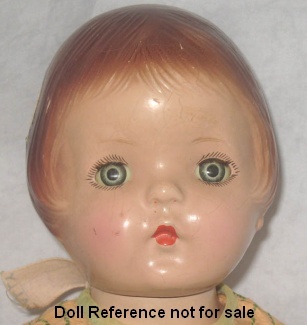 This doll face mold was also sold by Horsman who called her Boots and is unmarked, the Maxine Doll Company named her Mitzie as she is marked on her back. 1929-1940s Effanbee Patsy Ann doll, 19" tall, all composition jointed body, composition head, molded painted hair, sleep eyes, closed painted mouth, right arm bent. Patsy Ann is marked: Effanbee, Patsy Ann, Pat. # 1.283.558. 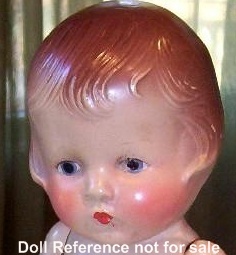 Very similar hair style as the above doll, about the same length of hair curling over the ears and towards the face, also, the short bangs are sweeping from the center towards the side of the face. Not exactly, but darn close we'd say. 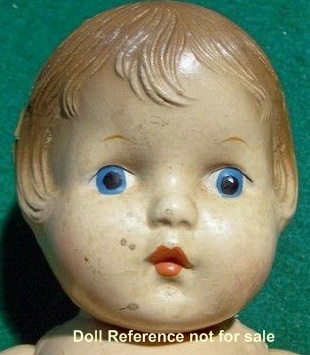 There is a whole family of Patsy dolls, in sizes from 30" to tiny 6" tall made from 1926-1946. 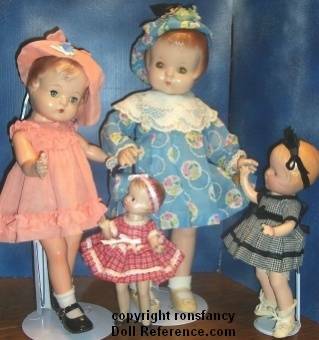 Others in the Patsy doll family are: Wee Patsy 6", Baby Tinyette 7", Tinyette Toddler 8", Patsy Babyette 9", Patsyette 9", Patsy Baby or Babykins 10", Patsykins or Patsy Jr. 11", Patsy, Patricia, or Skippy 14", Patsy Joan 16", Patsy Ann 19", Patsy Lou 22", Patsy Ruth 27", Patsy Mae 30" tall. 1929 Patsy Ann doll, 19"
1929-1930 Amberg or Horsman, Peggy Jr., Peggy and Peggy Ann dolls, 12-20" tall. All composition, molded painted hair with a pin in head for a ribbon, have a right bent arm, fully jointed, painted eyes or sleep eyes. The large 20" size Peggy Ann has a shoulder plate head on a cloth body and is unmarked. The 14" size Peggy is marked: Amberg/Pat. Pend/L.A. & SD. © 1928 and was from the Amberg line and is a body twist doll. The 12" size is marked: IT and is the Peggy Jr., thought to also be by Amberg, who is shown on right, she has painted eyes. 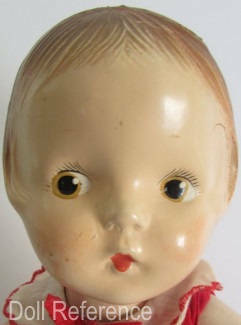 1931 Acme Toy Company Marilyn doll, a Patsy type doll, 16" tall, marked on neck: ACME TOY COMPANY. All composition jointed body, molded painted hair, tin sleep eyes, closed mouth. 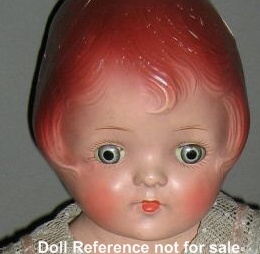 1930s American Character Sally doll, 12-19" tall, Patsy type, all composition, or cloth shoulder plate with composition head and limbs, molded hair with painted eyes or wigged with sleep eyes, some are unmarked others may be marked Petite or Sally a Petite Doll. 1930s Arranbee Nancy doll, 11-22" tall, Patsy type competitor, all composition, or composition head and limbs with a cloth stuffed body, molded hair, painted eye or sleep eye, open mouth, marked: ARRANBEE, R & B, NANCY or unmarked. 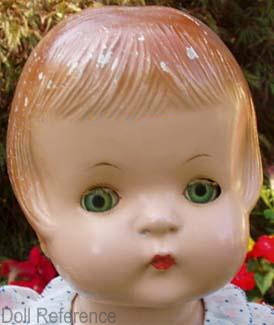 The 16" Nancy shown has blue tin sleep eyes. Note: Arranbee used several different head molds over the years for Nancy, so not all will have this exact hair style, and still be a Nancy doll. 1930s Averill Peaches Doll Family, Patsy types, 14-19" tall, composition shoulder head and limbs, cloth stuffed body or all composition head and jointed Patsy type body, molded painted hair, some have a pin hole for a hair bow, all the Peaches dolls have two small curls just behind their bangs on top of the head, tin or glassene sleep eyes or painted eyes, small closed painted mouth. 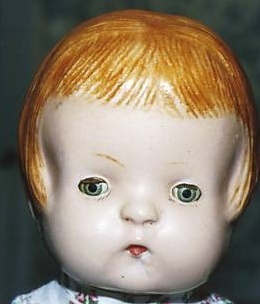 Peaches doll, 16 or 19" tall, all composition doll with a jointed body or composition shoulder head, with a cloth body, tin or glassene sleep eyes, small closed painted mouth. Polly Peaches doll, 17", Bud doll 14", all composition doll with a jointed body, tin or glassene sleep eyes, small closed painted mouth. Blossom Peaches doll 14" tall, all composition doll with a jointed body with painted eyes, small closed painted mouth, who is shown at right. 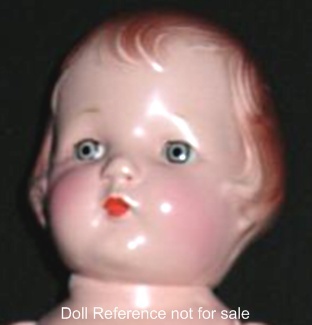 The largest size Peaches doll is sometimes marked: A.M. Co., Averill Manufacturing Co., other size Peaches could have a similar marking, ACO Inc., or all dolls can be unmarked. 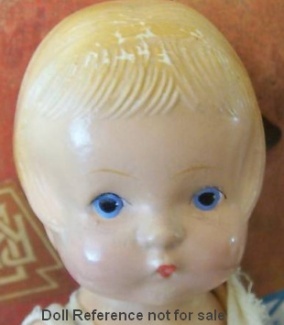 1930s Eegee Goldberger Chikie doll, 17" tall, Patsy type, all composition jointed body, molded painted hair, tin sleep eyes, open smiling mouth, doll is unmarked, but had a paper hang tag stating; "Chikie, Another EE-Gee doll". 1931 Horsman Babs doll, 12", Sue 14", Jane 17 1/2" and Nan 20" tall, all composition jointed body, molded hair, tin (Babs has the tin eyes) or glassene sleep eyes for the other larger sized dolls, closed painted mouth. These were Horsman's 2nd attempt to get in on the Patsy type dolls. These dolls replaced the Peggy family of dolls they acquired from Amberg. 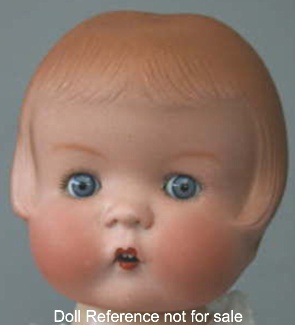 Dolls are unmarked, so memorize those sculpted front bangs, lol. 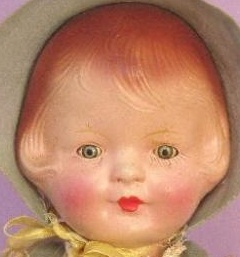 Horsman supplied a similar Patsy type doll to Sears who sold the dolls under the trademark names of Dainty Dorothy and Sally. Babs should have tin sleep eyes, while the photo shows painted, perhaps they made both, or she could be one of the Sears dolls. 1930's Horsman Sue look a like doll, 14" tall, unknown doll maker, Patsy type, all composition jointed body, molded painted hair, painted straight ahead eyes and closed painted mouth. Dolls are unmarked. 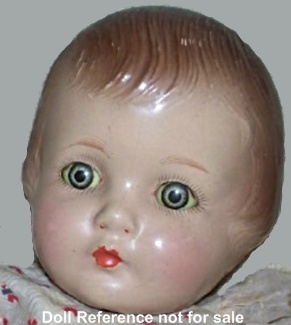 Horsman's actual Sue doll came as both a black or white doll. 1931 Horsman, Jane doll, 17 1/2" tall, Patsy type, all composition jointed body, molded painted hair, tin sleep eyes, closed painted mouth. Doll is unmarked. 1931 Horsman, Nan doll, 20" tall, Patsy type, all composition jointed body, molded painted hair, sleep eyes, closed painted mouth. Doll is unmarked. 1931 Regal Doll Manufacturing Company, Maizie doll, 16" tall, Patsy type, all composition, jointed at neck, shoulder and hips, molded painted hair, gray tin sleep eyes with no upper lashes, painted wispy lower lashes or painted eyes, closed painted mouth, came dressed in a short sleeved sun dress, bonnet, socks and oilcloth tie shoes, doll is unmarked. Had a hang tag that states a Kiddie Pal Dolly, made by Regal Manufacturing of Trenton, NJ. 1930s Toy Products Manufacturing Company, Inc., Lil Sis doll, 13" tall, Patsy type with painted molded hair, this all composition doll has a one piece body and head (no neck joint), jointed at the shoulders and hips, painted eyes looking straight ahead, closed painted mouth. 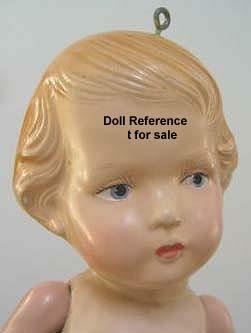 Uses the Regal Doll Company's Maizie doll head mold, doll marked on back: TOY PRODUCTS, MFG. CO INC.
ca. 1930s Skippy type boy doll, 12 1/2" tall, Skippy is F & B Patsy doll's boyfriend (the actual Skippy 14" doll has a big painted molded curl on forehead and is marked Effanbee), all composition doll, this look a like boy has been found with a one piece head and Patsy type body with the oval round tummy, jointed at shoulders and hips, also found with a jointed neck. Slightly molded brown painted hair with a small curl in the center of his forehead, blue painted or decal eyes, small closed mouth. One doll found has molded painted brown boots, others were bare foot, two dolls found were wearing khaki army uniforms; jacket, dickey, pants and hat, doll is unmarked, doll maker unknown. ca. 1930s Skippy type boy doll, 12 1/2"
ca. 1930s Regal Doll Manufacturing Company, The Judy Girl doll, 19" tall, Patsy type doll, composition shoulder head, composition arms, partial composition legs, cloth stuffed body with stitched hips, molded painted hair, blue tin eyes, closed painted mouth. Doll mark The Judy Girl, hang tag states she's a Kiddie Pal Dolly. 1932 Ralph A. Freundlich Trixiette doll, 9 1/2" and Trixbe dolls, 11" tall, Patsy type, all composition five piece jointed body, straight ahead facing blue painted eyes, rosey cheeks, painted molded yellow hair with pin hole in head for a ribbon, doll shown, is redressed (looks like an original outfit for a Quiz-Kins doll by Alexander). Dolls are unmarked. 1930s Doll Corporation of America Polly Prim doll, 12" tall, Patsy type, all composition jointed body, very lightly molded painted brown hair, brown painted eyes, closed painted mouth. Polly Prim came in a trunk with a wardrobe. Doll is unmarked. 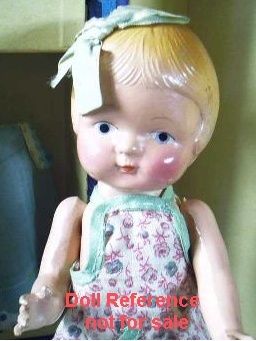 Polly's molded hair is nearly identical to the Bobby Anne doll by Regal who is a blonde with blue painted eyes, shown below. Note: Domec Toy Company & Century Doll Company merged in 1928 to become Doll Corporation of America and continued to use Domec as a trade name. 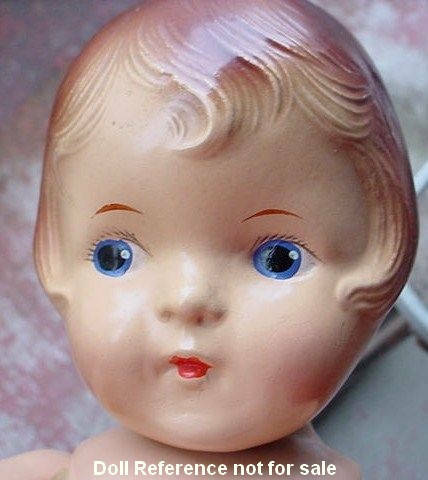 1930s Regal Doll Manufacturing Company, Bobby Anne doll, 12" tall, all composition jointed body with painted blonde molded hair, painted blue eyes and closed painted mouth. The Bobby Anne doll came in a cardboard carrying case with a wardrobe and oilcloth roller skates. 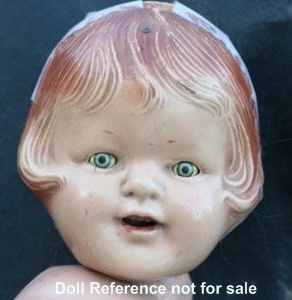 Doll is unmarked, hang tag states she's a Kiddie Pal Dolly, Patsy or Patsyette type competitor. This doll also came with a mohair wig over her molded hair with blue tin sleep eyes, 13" tall, came without a carrying case or wardrobe. Note: As you can see Bobby Anne's molded hair is nearly identical to the above Polly Prim doll who is a brunette with brown painted eyes and both dolls are unmarked. 1941 Lu Jon Sun Tan Colored Doll Company, Lu Jon doll, 10" tall, Patsy type, black dolls, all composition, one piece body, joints at shoulders and swivel body twist waist only, straight stationary unjointed legs, molded painted hair, (some with three black yarn pigtails like topsy dolls) side glancing painted eyes, closed painted mouth, doll marked PAT APP'LD or unmarked. ca 1930s-1940s Uneeda Patsy type doll, 14" tall, all composition jointed body, painted molded hair, painted eyes, closed painted mouth. Doll is unmarked. ca 1930s-1940s Uneeda Patsy type doll, 14"
1927 Maxine Doll Company Mitzie doll, 14" tall, socket head with all composition jointed body, molded painted hair, large painted eyes, doll marked Mitzie by Maxine, Pat. Pend. made by the Maxine Doll Company. 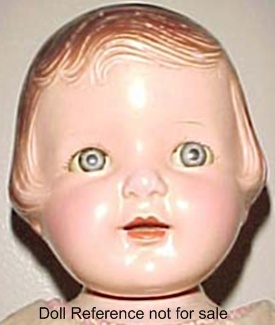 Note: These dolls were also sold by: Averill who named their doll Jimmie or Dimmie, Horsman who called their doll Boots who has a body twist waist, Butler Brothers and Sears named her Tootse. See the Averill Jimmie doll shown above. 1928 Woodtex Company Patsy type doll, 24" tall, all composition jointed body at neck, shoulders, lower waist and upper legs, molded painted hair, tin sleep eyes, closed painted mouth, swivel twist lower waist similar to the Lu Jon doll, doll is marked PAT APP'LD FOR or unmarked. 1929 Joy Doll Corporation, Joyce doll, 16" tall, all composition, represented a little girl, had a red wig, blue painted eyes, wore a floral printed dress and hat. We think under her wig is molded hair like the below Baby Joyce, but will need further research to confirm, doll is unmarked. ca. 1930s Joy Doll Corporation, Baby Joyce doll, 12" tall, all composition doll, molded painted hair or unpainted wigged, painted blue eyes, closed mouth, wore a sleeveless one piece dress with high waist and pleats, socks and shoes, came with a button/pin that states; Baby Joyce, The Children's Favorite, doll is unmarked. 1930s Goodyear Toy Company Patsy type doll, 16" tall, all composition jointed body, molded hair, tin sleep eyes, closed painted mouth, doll marked Goodyear Toy Co.
1930s Phyllis, 11 1/2, 13 1/2" tall and possibly other sizes, Patsy type, all composition jointed body, molded painted black hair, painted brown eyes, closed painted mouth, white or black doll, marked on back Phyllis or unmarked made by the Bouton Woolf Company.